Quick Test Professional (QTP) is a software that facilitates Automation Testing for software applications – Functional and Regression testing to be more specific. QTP comes with a user interface that can be considered an Integrated Development environment (IDE) for the test itself. The IDE has various features that aid the tester to develop a comprehensive script which would successfully validate the purpose of the test. QTP uses a scripting language built on top of VB Script to specify the test procedure, and to manipulate the objects and controls of the application under test QTP. At OdiTek we use QTP not only for its reliability but also for its detail report. We have the most talented team of programmers and testing experts, who know almost every testing softwares like no other. They specialize in Quick Testing Professional and use a number of ways, customizing them and programming them to test every software and application to the core. Our testing experts are some of the hardest men to please, and they test every aspect of any application or software before certifying them. Presents the test case as a business workflow to the tester (simpler to understand). Uses a real programming language (Microsoft’s VBScript) with numerous resources available. QuickTest Pro is significantly easier for a non-technical person to adapt to and create working test cases, compared to WinRunner. Data table integration better and easier to use than WinRunner. Test Run Iterations/Data driving a test is easier and better implement with QuickTest. Can enhance existing QuickTest scripts without the “Application Under Test” being available; by using the ActiveScreen. Can create and implement the Microsoft Object Model (Outlook objects, ADO objects, FileSystem objects, supports DOM, WSH, etc.). Numerous existing functions available for implementation – both from within QuickTest Pro and VBScript. The Test Report is more robust in QuickTest compared to WinRunner. Integrates with TestDirector and WinRunner (can kick off WinRunner scripts from QuickTest). 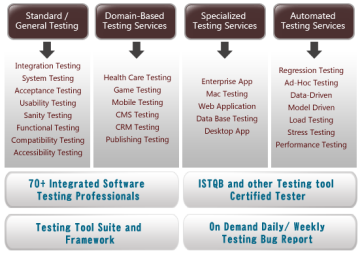 QuickTestPro Automated Test Development has been a unique service offering at OdiTek. We have a Certified and qualified Expert team in QTP, with average experience of 8+ years, who will help you to automate your application using QTP. Using proper Framework, shared Object Repository, Descriptive Programming, Automation Object Model, and other advanced techniques, they automate your applications and assure you to get a better ROI. We have done many projects on QTP. Our QTP engineers has hands on experience on QTP 9.2v, QTP 9.5v, QTP 10v, QTP 11v and they are always updated with the new releases of QTP and it's plug-ins.